August 23, 2015 nicolahughes77Leave a Comment on What’s Your Real Obstacle? This is Mine! What’s Your Real Obstacle? This is Mine! What’s Your Real Obstacle? This is Mine. No matter what, do you find it really hard to get certain things done? Have you got aspirations but really can’t see how you will get there? Is something in your life rail-roading you? The next blog on my mind was to write about all the obstacles that get in the way of reaching our goals. I’d fully expect things like; belief in self, money, lack of knowledge in key areas, time, to name but a few. I was going to post a picture of my mind map of jumbled mess of obstacles (before I obliterated them) and I was going to tell you how I overcame them and empower you to do the same. I’ve had a fairly good day of getting most things done and all pickles were fed and fairly happy. That evening I was revved up and ready to sit at the laptop and do some work on my dreams and my big mission. I’d already overcome some obstacles of wanting just to veg out and watch mindless TV. However, the youngest pickle woke up and screamed and no matter what would not stop. She was awake and up. I look at my actual obstacle list now and think that’s all fairly easy to overcome compared to getting this one to sleep. Do you struggle with self-doubt and wondering if you’ve got what it takes to do what you want to do? Are you juggling a million things and don’t know how to prioritize? Are you short of money and it’s stopping you from getting a proper website or business cards? Have you got no idea how to create a business plan? Many of these obstacles can be identified and overcome with some thinking and support. However, some things aren’t so movable. Maybe your partner is home really late and you never get chance to get on with it. Maybe your pickles are really little and need something from you that only you can give right now. Maybe they’re not so little but still need you. I will always understand that sometimes it’s just not that easy. I understand because I’m living it. Some obstacles I can move and some need embracing and soothing and when they are ready they’ll go back to sleep and let me get on. I cherish this little obstacle (Not the pox obstacle that can get gone!). Truthfully work out if your obstacle is a big ugly excuse for not getting on with it or whether you need to accept that this is your season right now. Keep dreaming and don’t lose heart. And if once a day you can grab 5 minutes to research something, write an idea down, watch a You Tube, by the end of the week you’ll be 35 minutes nearer your goal. 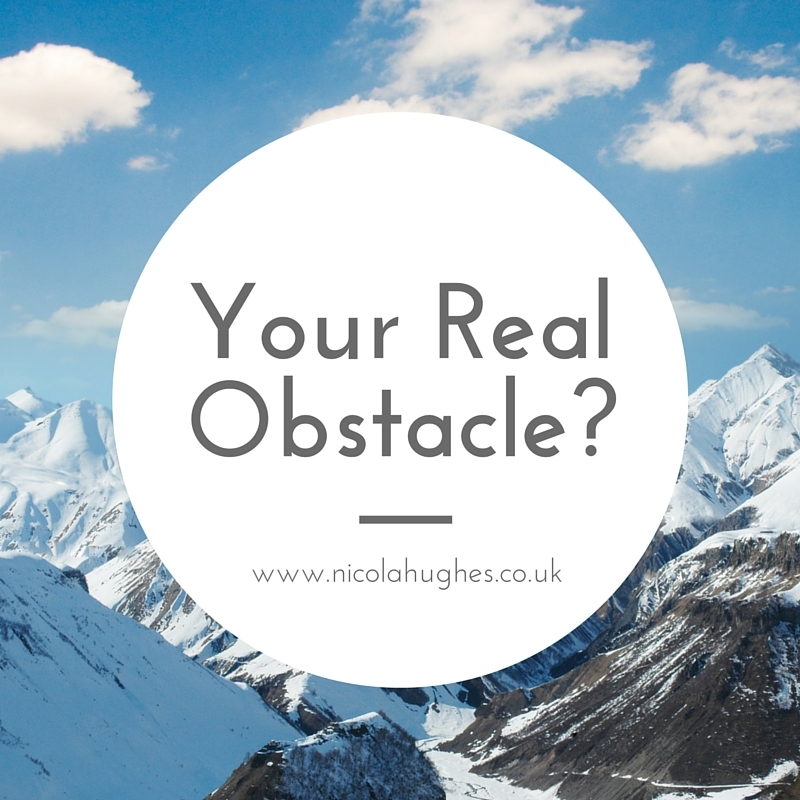 Then join the community of like-minded women at: www.facebook.com/nicolahughescoaching and let us know what your real obstacle is. PPs. Don’t forget to share this with your like-minded friends. Next If Your Outside Self Is Broken…Read This!